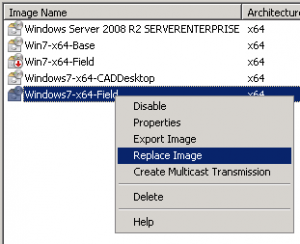 I use Windows Deployment Services (WDS) under Server 2008 to deploy images of Windows 7 x64 over PXE to my desktops and laptops. I’ve standardized on Dell Latitude and Optiplex computers, so I want these drivers to remain in place after the sysprep, so they don’t need to be added later. Apparently Server 2008 R2 WDS has the ability to add drivers through the GUI, but I don’t have that luxury yet. Here’s how I’ve gotten these drivers into my image. 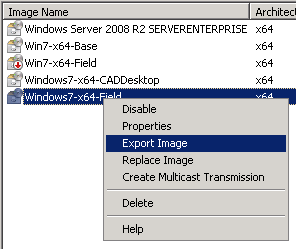 Now re-import the image, either by adding, or replacing the existing one from the right click menu.